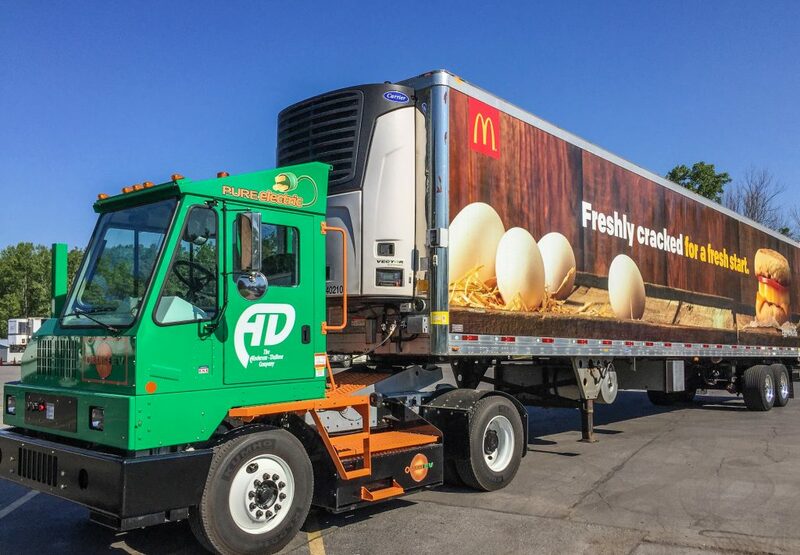 KANSAS CITY, MO and ROCHESTER, NY, August 29, 2017 – Orange EV and The Anderson DuBose Company today announced the deployment of the first 100% electric, class 8 truck in the McDonald’s distribution network. The Orange EV T-Series electric yard truck replaced its diesel predecessor at The Anderson DuBose Company’s Rochester, New York distribution center where it manages and moves dispatch trailers in a seven-day-a-week operation. Replacing a heavy-emitting diesel yard truck with pure-electric completely eliminates that vehicle’s emissions and diesel fuel consumption, an important step in the sustainability efforts of both Anderson DuBose and McDonald’s. Moving to electric also provides a better working environment for Anderson DuBose employees with a truck that is smoother, cooler, quieter, and cleaner. “I’ve heard nothing but great comments from the drivers,” said Tom Hank, General Manager of the Anderson DuBose Rochester facility. “Orange EV’s truck is more comfortable and our operators really like the quiet and smooth operation. Management is pleased that we can provide a safer and healthier working environment – the truck has no engine and no emissions.” This change also positively impacts its neighbors and broader community. “We appreciate the spirit of partnership and sense of shared-mission the entire Anderson DuBose team has brought to the relationship,” noted Mike Saxton, Orange EV’s chief commercial officer. Headquartered in Lordstown, Ohio, The Anderson DuBose Company is dedicated to being a leader in the distribution industry by providing world-class service and brand protection to its valued business partners. Anderson DuBose is “Delivering with Pride – One Case at a Time” to more than 570 McDonald’s and Chipotle restaurants in three states. The Rochester, New York distribution center services over 215 McDonald’s restaurants in New York and Pennsylvania. Contact Anderson DuBose at THank@Anderson-DuBose.com, 585-334-2400, or visit their website at anderson-dubose.com. Kansas City based Orange EV is the leading OEM providing industrial fleets with heavy duty electric solutions that do the same work while eliminating diesel fuel and emissions. Building both new and re-powered vehicles, Orange EV was the first to commercially deploy 100% electric Class 8 vehicles into container handling operations; Orange EV is the only manufacturer filling re-orders for continuing fleet deployments of 100% electric class 8 trucks. Contact Orange EV at 866-688-5223, sales@orangeev.com, or by visiting the company’s website at OrangeEV.com. Media: Contact Mike Saxton at 866-688-5223 ext. 702 or MikeS@OrangeEV.com.